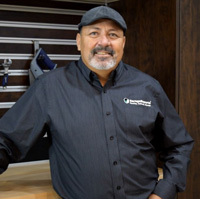 Wayne Mansanares is the owner operator of Garage Experts of Tucson, Arizona. Wayne has over 28 years of extensive experience in project management in the gold mining industry. Born in Phoenix and wanting to start his own business in the great state of Arizona, he researched Garage Experts found it to be a perfect match. Wayne’s father was a general contractor, so he grew up in and around the construction business. With his construction background and passion for all vehicles, garage makeovers is the perfect fit. Wayne is a factory trained epoxy flooring system and cabinet installer. When he serves your garage renovation needs, you’ll be dealing with someone who is passionate about quality, precision, and excellence. Wayne believes in Customer Service, which means you will be served by someone who genuinely cares about your needs. Garage Experts of Tucson is locally owned and operated, uses the finest material built here in the USA, and prides itself using these products to provide the customer with superior quality and unmatched service that is second to none. Free estimates will be given on site, so give Garage Experts of Tucson a call today to make an appointment and make your garage an extension of your living space. GarageExperts of Tucson is your local garage makeover expert. View some of our recent work.